An AI assistant that helps medical students grow communication skills based on real-life conversations in the hospital. Today's medical students and physicians struggle to gain medical communication skills due to the suboptimal learning tools throughout their education. 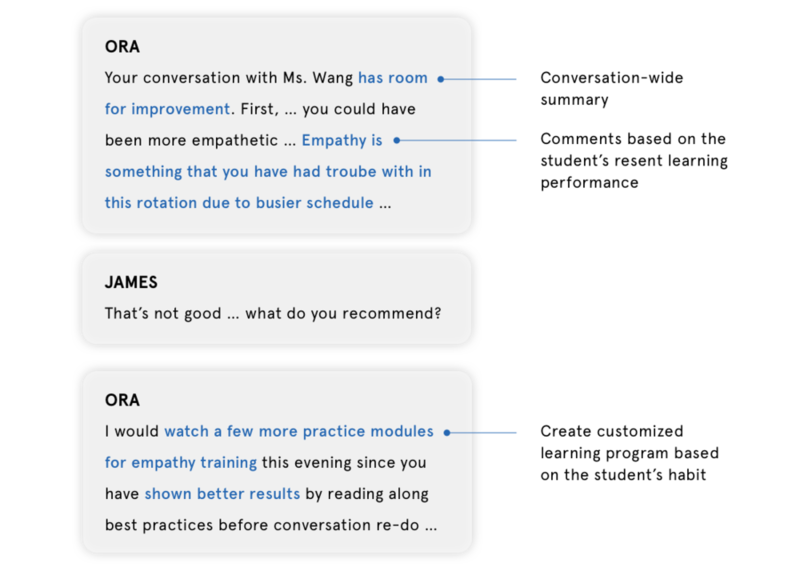 Ora, a medical communication assistant that leverages AI's natural language processing capability to help medical students prepare, practice, and evaluate their communication skills based on their real conversations in the hospital. 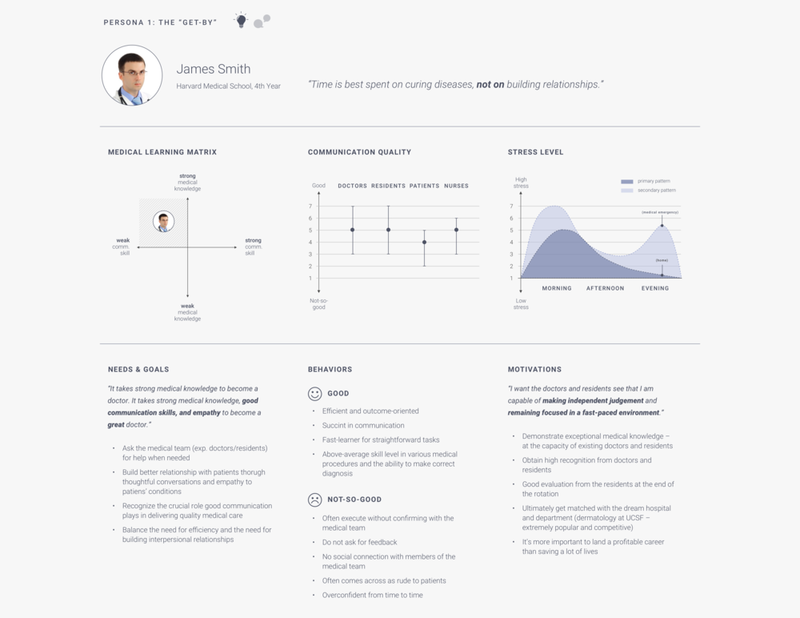 I worked primarily on the in-hospital interactions – smart watch and voice/audio UX/UI. The smart watch enables hands-free access to personalized learning materials and instant feedback in the hospital. Before any conversation, the student can view a list of best practice items populated by Ora based on what the student has recently learned or felt short on. After the conversation, Ora provides speech evaluations by topics and clarifies the specific terms and behaviors that cause conversation breakdown. The ear bud collects the student’s conversation upon the patient’s approval and provides access to Ora’s virtual assistant. During the conversation, the ear bud sends out distinguishable sound notification as in-moment correction without major interruption. Ora’s voice assistant offers detailed feedback for any past conversation and creates the student’s learning schedule upon request. The tablet is the principle learning tool for any at-home learning. At home, the student practices with the virtual avatar based on real (anonymized) conversations he/she had during the day. The student may also see his/her learning progress and review learning modules as needed. I provided support in CX design and feature development. How to measure success in learning? Please see our final presentation for more feature-specific information. Given the prompt “design a system that is a symbiosis of learning and AI”, we employed different research techniques to identify and narrow down opportunity areas. 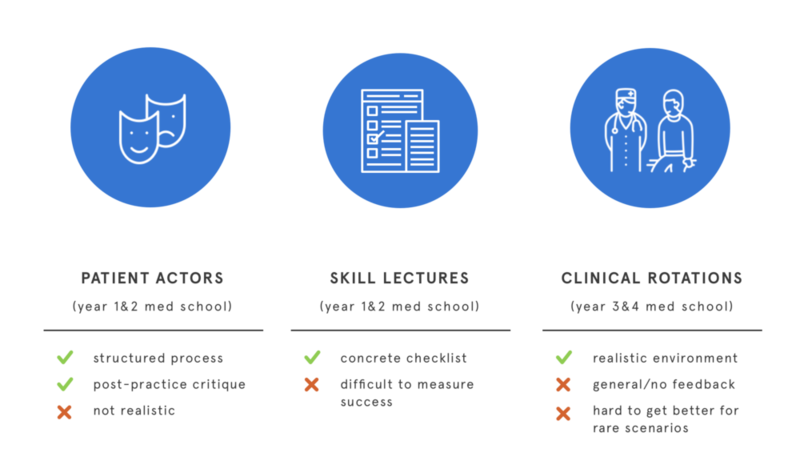 Once we defined the domain – learning for medical students, we conducted a series of exploratory research – including interviews, surveys, literature reviews, and market research in the medical education field. The synthesis of the early exploratory research was a rigorous 6-step process that started with a wall of "insights" extracted from exploratory research, ran through two rounds of affinity mapping, one round of 2x2 matrix, and the final set of design principles. After the synthesis we were able to further scope our project – we determined the learner, the learning type, the problem statement, and the design principles. This stage involved four research activities to identify challenges for rotation students. With the learning, we established personas to better capture their pain points. We started with looking into existing communication learning methods in medical schools – what worked and what didn’t work? and for what type of students? We found that no one method can satisfy all success factors. After defining our target design audience, we conducted a text-based diary study to eight 3rd and 4th year medical students to learn about the specific communication challenges in their current rotations. We also created a summary for each participant based on their identified stress level with different hospital personnels. 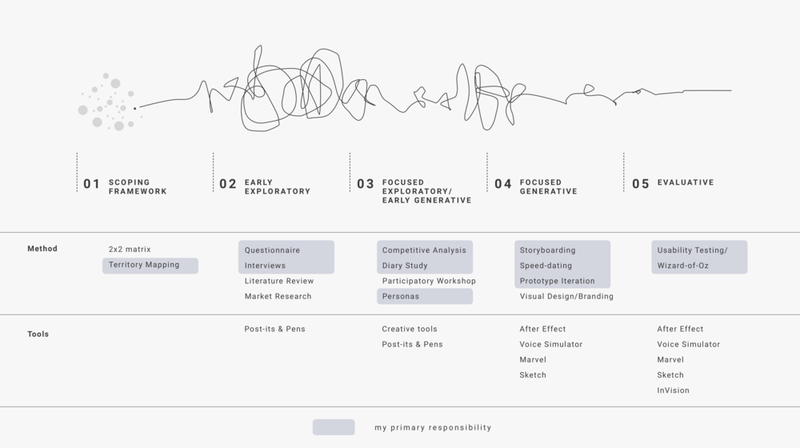 We later used these profiles as the foundation for persona building (see synthesis section). Together, we identified common high- and low-stress scenarios and learned about medical students' own reflection on communication improvement. Followed by the diary study, we launched a participatory workshop at UPMC (University of Pittsburgh Medical Center) to understand how medical students may use creative tools to come up with solutions to their specific communication challenges. We interviewed a total of 20 medical professionals – 4 medical students, 3 residents, 3 physicians, and 10 nursing students. Feedback from non-medical students were particularly insightful for us to understand their challenges from all perspectives. Based on the previous research, we created two student personas and two corresponding AI personas. The student personas capture the unique challenges and priorities for weak-communication-skill students who have strong and weak medical knowledge. 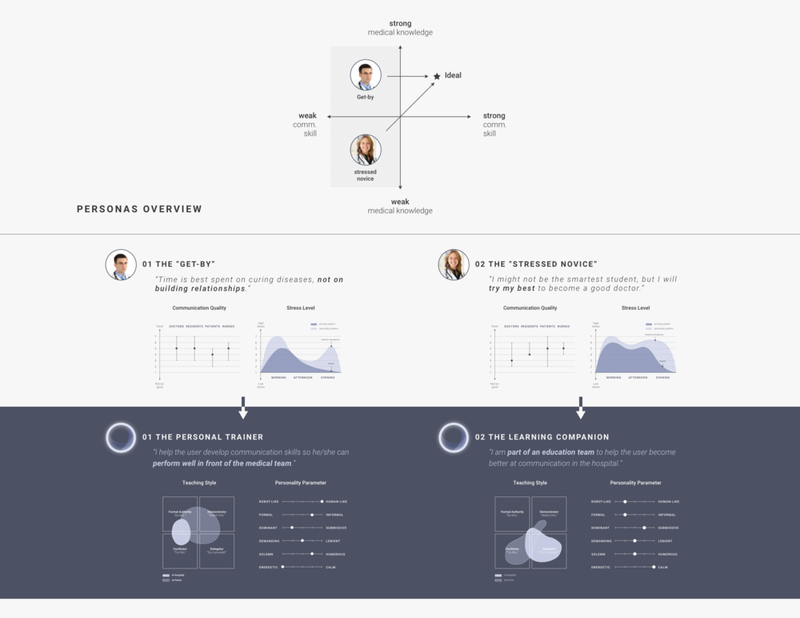 The AI personas reflected the personas’ needs in the personality design and teaching styles. Based on the persona study, we started looking further into the needs and challenges to include "existing teachers (doctors and residents)" into the communication learning framework. We were aware of how drastically different the the user experience and flow in these two scenarios would be, and decided to focus more on the less collaboration model as we continued our design iterations. In this stage we used storyboards to get initial green light for our concepts and iterated on the products to gradually increase fidelity. Based on pain points and creative ideas emerged in the generative research, we went through three sets of design iterations involving six paper storyboards and one "video storyboard". The video storyboard was most useful in helping medical students envision and critique the concept during speed-dating. The feedback became much more concrete and actionable. In the design process thus far, we thought that this learning system had to involve the rotation students as well as the residents and doctors to be successful – but is it true? We knew that most residents already didn’t have time to attend rotation students and that most rotation students felt the need to “prove” to the residents who grade them at the end of rotations. Considering all the above, we decided that our minimal viable product would be a learning system for students only and iterated from this direction. When we initially designed the user/AI flow, we kept our options open in terms of interfaces – including both screen and voice. Started with a very sophisticated system, we worked our way to simplify the flow, clarify evaluation criteria, and identify the most suitable interfaces at each touch point. The final design (before Wizard-of-Oz testing) featured a pre-convo checklist, simple in-convo “ding” notification, and a post-convo scoresheet. Toggle below to compare the final vs. initial user flow design. The design principles here are (1) succinct (2) hands-free (3) useful content. Through our iterations, smart watches turned out to be most preferable for checklists and scoreboards – the watches are personal, convenient, widely adopted, and hands-free. Design iterations on smartwatch UI focused primarily on legibility and content. While our in-convo intervention in the video storyboard received lukewarm feedback, we knew from literature review that making corrections right away was a key learning opportunity. We explored a range of interfaces – haptic feedback from watch, voice (English phrases), and audio (“ding”). We knew we found the right “ding” when the user’s conversation didn’t appear disrupted when the cues were sent. For the at-home training module, we wanted to explore how emerging technology can mediate the “not realistic” pain point for existing solutions. We also developed a tablet mode as the controlled group. Note: I had little involvement in the design iterations of VR and tablet UI. With our prototypes, we went to the hospital (UPMC) again and tested our concept with eight 3rd- and 4th- year medical students who individually participated in a 20-minute session. Overall, the participants were very excited about the system and were more optimistic and open about certain privacy issues than we initially expected. One surprise takeaway was that our “student-only” MVP was much preferred by the medical students. We also reflected the feedback we got for in-hospital notifications on smart watch and voice. Voices (in-convo “dings”) stayed relatively the same, while the smart watch messages underwent minor UI changes to increase glanciblity. We have learned to make the most of existing resources by trying our best to harness local and remote participants and gave compensation for their time out-of-pocket. The resulting personas was very helpful to keep us in check and avoid “designer biases”. We spent a lot of time researching AI’s capabilities and limitations. In the medical field, there are a lot of contextual learning challenges that can be difficult to address in AI. Nonetheless, we wanted to push the boundary and leverage the existing communication framework in academia to help students follow best practices. During our design iterations, we had a hard time getting feedback on usability because our content weren’t accurate. While we eventually overcame this with generous help from medical professionals, this experience highlighted the weakness of a designer-only team. For me, I was humbled by our research findings that continued to prove wrong our assumptions, highlighting the importance of a research-based, iterative design process. The critical next step would be circulating the idea with a larger group of stakeholders, including patients. We didn’t reach out to patients for ethical concerns in the design process. However, their feedback would be key to future concept validation and iteration.